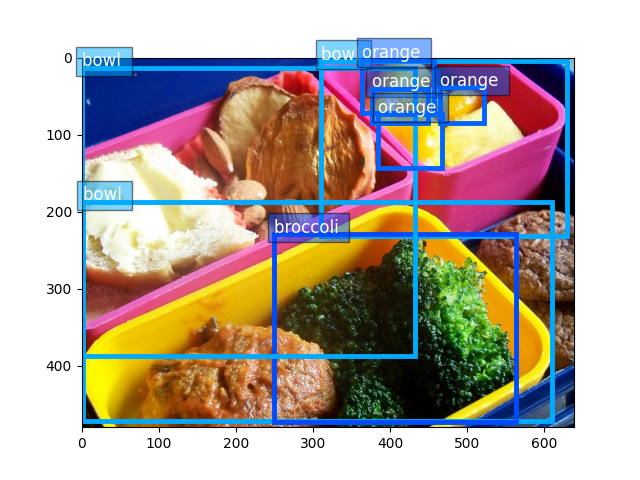 COCO is a large-scale object detection, segmentation, and captioning datasetself. This tutorial will walk through the steps of preparing this dataset for GluonCV. You need 42.7 GB disk space to download and extract this dataset. SSD is preferred over HDD because of its better performance. The total time to prepare the dataset depends on your Internet speed and disk performance. For example, it often takes 20 min on AWS EC2 with EBS. which will automatically download and extract the data into ~/.mxnet/datasets/coco. Loading images and labels is straight-forward with gluoncv.data.COCODetection. Now let’s visualize one example. Finally, to use both train_dataset and val_dataset for training, we can pass them through data transformations and load with mxnet.gluon.data.DataLoader, see train_ssd.py for more information.